More Golden Age Flash Archives! 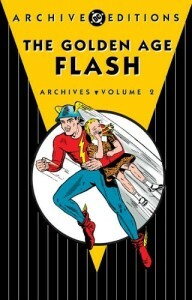 As I’ve gone through what little Golden-Age Flash material I have access to, I’ve once again lamented that DC has not yet published a Golden Age Flash Archives Volume 2. (Volume 1 was released in way back in 1999.) But in looking up info on the restoration process, I discovered a page that lists two volumes… and Amazon has a listing for volume 2, to be released on January 4, 2006! Apparently it will feature stories from Flash Comics #18-24 and All-Flash Quarterly #1-2! Edit Oct. 10: Confirmed! Today’s DC Comics Direct Channel Special lists the archive and its contents among the books scheduled for January-February. This entry was posted in Comics and tagged archives, Flash, Golden Age on October 3, 2005 by Kelson.